Simple Green will head outdoor as well, when the top big ball 1 wall and 3 wall players move to the outside courts at Los Cab. WPH Outdoor will award Yellow Jerseys and Huge Ranking Points for those playing in either one wall big ball singles/doubles or three wall big ball singles or doubles (just one division will get ranking points). WPH will broadcast select matches @ www.race4eight.com beginning Friday, to include outdoor. Airport: The closest airport is SNA Orange County, John Wayne, in Santa Ana, CA, w/8 mile (approx 13 kilometers) ride to the handball facility (Los Cab). LAX Los Angeles, is one hour to the facility in good traffic and as slow as three hours in bad traffic. LGB Long Beach Airport is 15 miles from Los Caballeros. 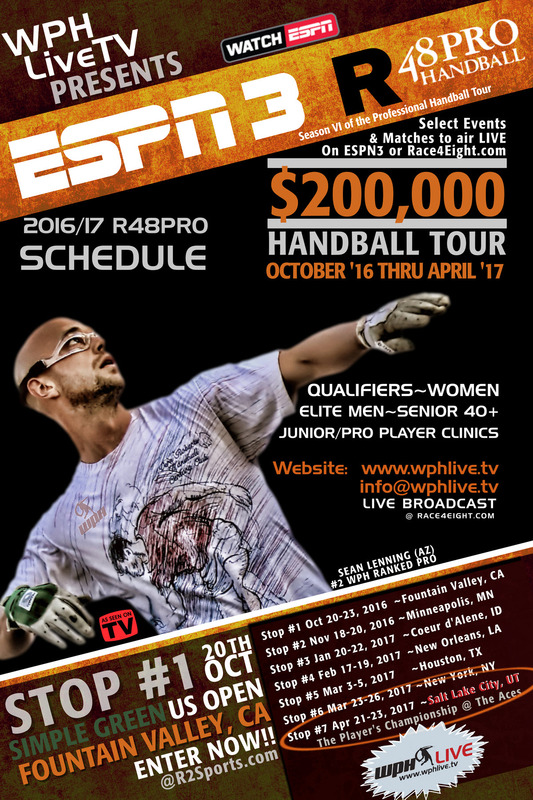 All WPH Players will use the R48Pro Handball (qualifiers, Senior 40+ & Elite Men); except the women, as voted by the players. Women will use the Red 21, by the USHA. See WPH for Code of Conduct, Player’s Agreements, Rules and General Tournament Questions: info@wphlive.tv.